There's a link to an external index above the list in the first post. Go there, click on a guide's name, then it's pretty straightforward. Last edited by ZiTribal; 08-24-2013 at 08:23 PM. Anyone have any guide of tales of xillia? It's been a while since I've checked, but is the old guide thread gone now? Yeah, that's gone, but what's on the list still manages to find its way around. Is posible GTA Five Guide please?? I second the request please. A user called Lament already took care of it. [Hidden link. Register to see links.]. Gabri, is that you? Long time no see, man, I'm Vicky, of Arklay. Wait, I'm not finished yet. You used to request a drawing in return for some of your rarest items, back on that board, right? Fill me on the details and you'll get whatever you want, I'm gonna add you on Skype now. Hello there, Miss. How've ya been?I bet Arklay's dead, huh? Can't say I miss that place, it ended getting full of human scum. At any rate, I hope you're doing well, too. I'll need a few days to get everything uploaded, but you'll get what you asked for. Don't worry about the drawing, besides, trades aren't completely allowed here. I'll connect this evening, now I need to get back to work. Last edited by Leon Scott Kennedy; 10-16-2013 at 12:56 PM. Have anyone the pokemon X/Y nintendo guide? I second the Pokemon X/Y guide please? Thank you. Looking all over for the new Lego Marvel Superheroes Guide..... anyone seen a pdf or ebook yet? Thanks in advance!!!!! Granted, this is a guide for a game that doesn't have many fans, but its bad rep has more to do with the movie than the game itself. 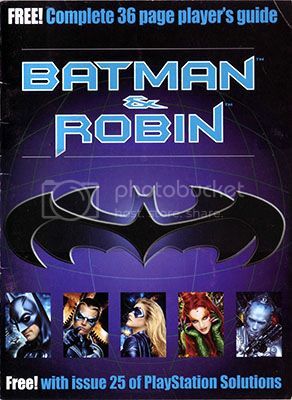 Terribly dated compared to modern Bat-games, and not only graphic-wise, but still worth a look. The Arkham Asylum stage is pretty cool. I remember someone requesting the Dissidia 012 BradyGames guide. Just wanted to say that it got out of private share-circles... I've a download link for it ready. All the credit goes to the original scanner and uploader. That was worded wrong. It's not like the link isn't working, anymore, the file was "removed" due to copyright takedown notice(s). PRIMA finally noticed EP, took them long enough; glad to see, though, that with the way I've named my files, some of the PRIMA guides are still hosted. I probably shouldn't do this, but register on their board and contact MasJ, they might have been forced to remove most PRIMA guides, but they should still be owned by the Webmaster, or some of the Staff. Guess I'll get a bit more requests, now. heh. It was great while it lasted.